Barcelona have lost 2 of their 10 Champions League matches this season and with Messi as their super-sub against PSG they cant afford for him to be missing against Bayern, Barca have won the Champions League 5 times 1992 2006 2009 and 2011. Bayern have lost 2 of their 10 Champions League matches this season and have clearly won the Bundesliga this season. Bayern have talented players most from Germany and their superb players like Robben, Ribery Alaba. Bayern will be a difficult challenge for Barca, Bayern was in the final last season and failed to win on penalties against Chelsea. Borussia Dortmund haven’t lost this season in the Champions League, they've also beat Madrid once this season in the group stage 2-1 then drew to them 2-2 in the other match. So this will be a interesting match. 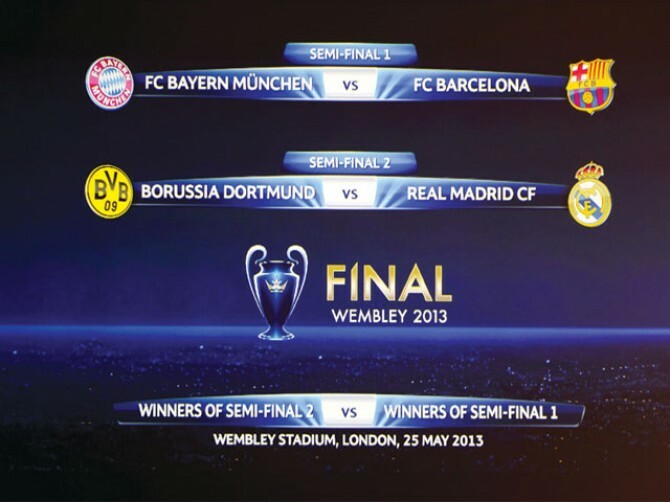 Will Dortmund show that the underdogs can win the grandest trophy? Real Madrid have lost 2 of their 10 Champions League matches this season with their star man Cristiano Ronaldo being on form will he able to lead he's team to victory or will the Spanish giants get eliminated Real Madrid seem to be on form and so a Dortmund. These are a must watch matches.